A lot of different data from satellites exists for rendering views of the earth. 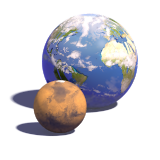 Using the techniques described on the planets rendering page it is possible to generate high quality high resolution images. Over the time both available data and techniques improved and here you can find images from several stages of this process. A large collection of closeup views and panoramas can be found on the Views of the Earth site and you can license views on the Imagico.de services and products. Note the technical and data related content formerly here has been moved to the geo-visualization section. Here you can find all stuff directly related to 3d earth rendering. After high resolution height data from the SRTM mission was made available i started rendering closeup views also using higher resolution color images. Some test images made with the Blue Marble next generation data sets. A commented sample scene demonstrating the earth rendering techniques.